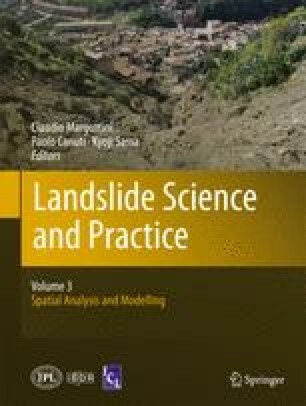 To model the evolution with time of the Bindo-Cortenova translational landslide (Italian Prealps, Lombardy, Italy), a 1D pseudo-dynamic visco-plastic approach, based on Perzyna’s theory, has been conceived. The viscous nucleus has been assumed to be bi-linear: in one case, irreversible deformations develop uniquely for positive yield function values; in a more general case, visco-plastic deformations develop even for negative values. The model has been calibrated and subsequently validated on a long temporal series of monitoring data and it seems quite reliable in simulating the in situ data. This work was partially funded by the MORFEO-Italian Space Agency (ASI) project, within the Natural and Human Related Activities Induced Risks Program. The authors are also grateful to the Administration of the Municipality of Cortenova and of the Comunità Montana della Valsassina, Valvarrone, d’Esino e Riviera.